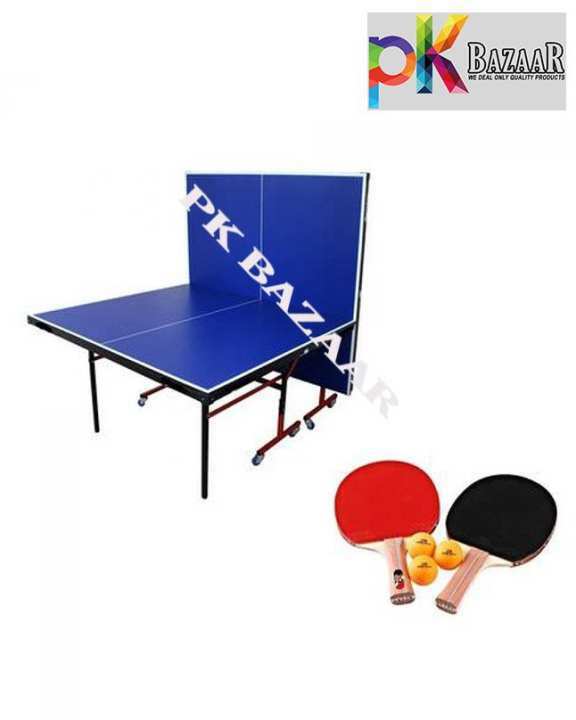 Butterfly Style Table Tennis Table Imported It’s brand new and imported TT TABLE and single player can also play at any time on it,it’s mean it’s butterfly style Table. It’s come with everything 2 butterfly Rackets ,3 butterfly ball and net. IndoorTable Tennis Tablehas been designed to give the best possiblefull sizeplaying surface incompactstorage format at thelowest price.This fully professional sized top has been constructed with two 12mm sheets of solid wood as seen on higher priced tables. These tops are then reinforced with a 20mm (yes 2cm) steel edging, with the undercarriage also being made from strong steel to ensure your table is both strong and providing you the best possible bounce. This is then treated for durability, painted to the regulation standard and logoed with brand for that total look.There are 8 legs which support all four corners of both halves. These steel box section legs fold away in pairs, each pair are joined by box section bracing bars. Each leg has its own red steel lockout brace, each with its own built-in safety release. When folded the legs interleave with each other so they fit under the lip of the table giving the absolute minimum storage space requirement. Each leg has a threaded adjustable height foot for those floors which aren't 100% flat and level. A spirit level (not included) is recommend for absolute perfection.